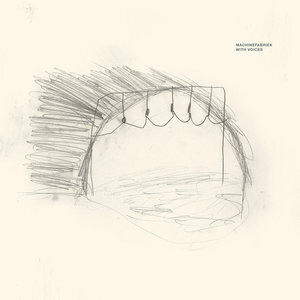 On With Voices, Machinefabriek collaborates with an array of highly reputed artists/vocalists, using his ambient techniques to accommodate their presence in his music. Rutger Zuydervelt, the man behind the Machinefabriek moniker, has been traversing the far edges of ambient, drone, and noise domains, producing minimalistic works of electro-acoustic experimentation. Since 2004, these sound design explorations have resulted in a rich discography, and Zuydervelt's return now in With Voices, sees him further expand on this path, but with a slight twist. On his new album, Zuydervelt once more implements his sound crafting techniques to produce his trademark soundscapes. However, this time around these are used to surround vocal performances from an array of esteemed guests, which include Peter Broderick, Marissa Nadler, Richard Youngs, Chantal Acda, Terrence Hannum, Wei-Yun Chen, Zero Years Kid, and Marianne Oldenburg. There is a subtlety in the core of Zuydervelt's work, and that is apparent in his ambient craftsmanship. The start of "I" sees this vision settle in, with Machinefabriek taking on a serene and yet electrifying form, reminiscent of Ben Frost's tactics. Similar is the subtle approach undertaken in "VI", where the minimalistic touch of Zuydervelt sees electronics and audio effects being left aside, and only the synth strings allowed to mold this ambient realm. This approach provides the resulting atmosphere with an organic touch, making it appear as a living organism that evolves through the various mutations Zuydervelt introduces. The ambient approach provides a fertile ground for introspection, and Zuydervelt expands on his ritualistic setting to bring forth the more towering manifestations of Machinefabriek. That is the case with the appearance of Peter Broderick in "III", which sees the soundscapes morphing around the spoken word component of the track. The last part of "V" also implements a similar approach, which further exposes the ceremonial-like motif of With Voices. Still, there is room for experimentation towards a different direction within this work, and it becomes apparent when the heavier editing process comes into view. "II" sees the vocal delivery of Chantal Acda being manipulated to great extent, creating a cut-up motif in impressive fashion. The result is a hazy sonic landscape, granting a further layer of abstraction to this work. "V" takes this mode a step further and produces an almost incoherent exploration of samples and sound design techniques. Still, Zuydervelt reaches the zenith of this approach with "VII", using once more this cut-up technique, merging vocal deliveries and field recordings into an amalgamation of harsh sounds. Despite this tendency towards the stripped down ambient progression and the heavy editing/processing of vocals, With Voices also provides a counterpart to this endless experimentation. The melodic aspect of this work is powerfully pronounced, making a subtle first appearance in the opening track, when the mood tilts towards the serene. The presence of Marianne Oldenburg takes this a step further, as she unleashes an impressive and beautiful delivery in "IV". Still, even more impressive is the conclusion of the record, where the great Marissa Nadler makes an appearance. Here, Machinefabriek take an even more minimal approach, allowing more space for Nadler's delivery, which results in an ethereal final act that concludes With Voices. With Voices is a very nice addition to the rich discography of Machinefabriek, one that sees the approach of Zuydervelt alter in order to incorporate these new elements to his project. The result is a strong record with a very nice balance between experimentation and lyricism.